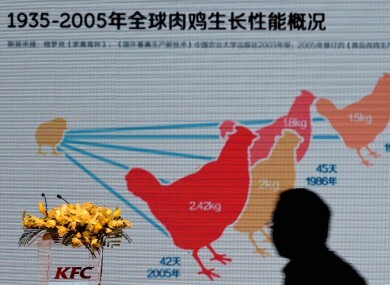 FAST-FOOD GIANT KFC has sued three Chinese companies over claims on social media it used genetically-modified chickens with eight legs and six wings. The fried-chicken chain is demanding an apology and 1.5 million yuan (€220,000) in damages from the firms which it said spread the false rumours on a popular mobile app, WeChat. KFC, which has 4,800 outlets in China and is the nation’s biggest restaurant operator, also wants the Shanghai court to order the infringements to stop immediately. The company’s China CEO, Qu Cuirong, said it was difficult for companies to protect their brands from malicious rumours on the internet, although the government’s work in recent years to “purify the online environment” had helped the situation. The Chinese government has been trying to crack down on rumours spread on social media and recently some internet marketers have been convicted of manipulating public sentiment by spreading false information about competitors. KFC’s reputation in China already suffered a major hit last year when it emerged expired beef and chicken was repackaged and sold to several fast-food chains. Sales at parent company Yum Brands, which also owns the Pizza Hut chain, dived even though the firm said it wasn’t one of the supplier’s main customers. Last year average turnover in its Chinese outlets was down about 20% with the division’s total revenues barely increasing despite it opening hundreds of new restaurants. Elsewhere it has also been on a PR drive to overhaul its image, including allowing the BBC behind the scenes at various stages in its supply chain to show the sources of the company’s food. Email “KFC is suing over claims it uses chickens with eight legs and six wings”. Feedback on “KFC is suing over claims it uses chickens with eight legs and six wings”.